An international consortium was the preferred provider for a new power plant, with capacity of 1,200–1,400 MW, to be delivered as a build, own, operate and transfer (BOOT) project. The project involved the design, financing, construction, commissioning, testing, ownership, operation and maintenance of a greenfield power plant and associated facilities over a 20-year period. The electricity company for whom the plant was to be built would provide the fuel, and take all the plant’s output under a power purchase agreement (PPA). Develop a project risk register that would be of value to the combined project team. Detailed discussion and assessment of threats and opportunities associated with each aspect of the project. Broadleaf prepared and facilitated the workshop. We also provided a skilled workshop recorder, so the workshop leader could focus on facilitation and getting the most from the workshop participants. 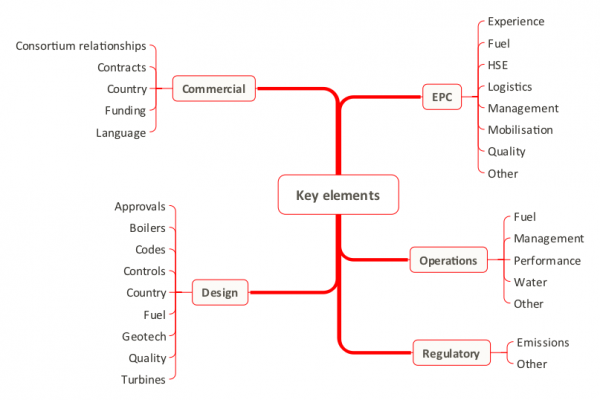 Our approach was based on the international risk management standard ISO 31000 Risk management – Principles and guidelines (compatible with IEC 62198 Managing risk in projects – Application guidelines), summarised in Figure 1. Establishing the context was completed before the workshop and was summarised in a briefing note. The risk assessment workshop identified the main threats and opportunities for the project, analysed their consequences and likelihoods and developed agreed priorities. Responsibilities were allocated for High risks. The development of detailed treatment plans for addressing the most important risks was the responsibility of the project team after the workshop. Responsibilities for threats and opportunities rated High were allocated during the workshop and were recorded in the risk register. Risks were interpreted as deviations from what was expected or planned to occur. Threats involved negative changes from desired objectives, while opportunities involved benefits or enhancements to project objectives. We reviewed project documents and developed an outline context statement. This was a critical preparatory step for a sound risk assessment process for the workshop. Aspects of the context are summarised in Table 1. 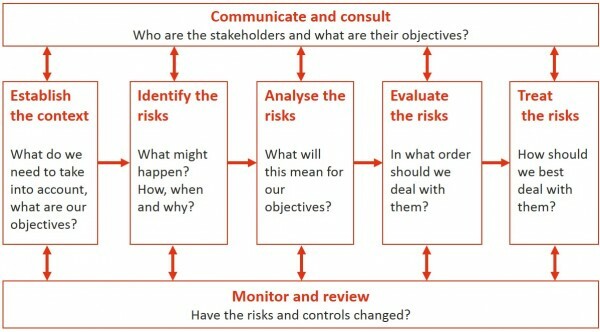 From the context analysis, we developed a set of key elements for structuring the risk assessment, summarised in Figure 2. This was an extensive set of elements, as there was time to explore all aspects of the project in detail over the planned three-day period. We prepared and agreed a set of scales for consequences, likelihoods and risk ratings to be used for setting priorities in the workshop, based on the context material. Consequences were measured in terms of the potential effect of an event or change in circumstances on the success criteria for the project. Criteria for assessing the effects of threats and opportunities on project objectives are listed in Table 2. The likelihood scale refers to the potential for opportunities or threats to occur and lead to the assessed level of consequences (Table 4). Low; a tolerable threat that could be managed by routine procedures. We prepared a short questionnaire for the workshop participants. This required responses on the top five threats and the top five opportunities in each area of the project, and the controls that were currently in place for each one. We compiled these responses into a preliminary risk register of over 60 headline risk items to take into the workshop. Notes on additional controls that might be considered. We prepared a briefing note for workshop participants. This set out the purpose of the workshop, summarised the context material and outlined the risk assessment process and scales to be used. On the day prior to the workshop, we discussed all aspects of the project with the project team, and reviewed the workshop presentation material. The objective was to confirm our detailed understanding of the project and to ensure all presenters understood the workshop structure, focus and timing requirements. We also confirmed the workshop administration and logistics. Conclusions: review of workshop outcomes and lessons, agreement on next steps. Thirty senior representatives from organisations associated with the project participated in the workshop. A large part of the workshop was devoted to information sharing, including some 20 presentations and associated discussions. The wide range of perspectives provided all participants with additional insights into the project, the project management processes that were planned, and their own roles in achieving project success. Workshop outcomes, next steps and conclusions. Further discussions were an integral part of the project risk identification, analysis and evaluation. The risk assessment followed a standard process. The same steps were followed for each key element in Figure 2. The workshop identified 128 threats and 28 opportunities, summarised in Table 6. There were no extreme risks. The primary outcome from the risk workshop was a risk register for the project, covering the design, manufacture, construction, commissioning and operations phases, with agreed ratings of consequences, likelihoods and levels of risk. This was a snapshot of threats and opportunities, as they existed at the time of the workshop, in a form suitable for use in subsequent phases of the project. As well as generating a risk register, the workshop generated significant understanding, communication and team-building outcomes. All participants had an opportunity to share their knowledge with the rest of the team. They developed an understanding of all aspects of the project, where their own specific areas of interest fitted into the whole and how they could contribute to the achievement of project outcomes. The workshop provided a structured environment in which the participants could interact, both technically and socially. They developed an appreciation of and respect for each other’s capabilities and experience and the value they could add to the project. By the end of three relatively long days, the participants had developed a solid sense of pride in what they had achieved together, and great confidence that they could go on as a team to deliver the project and achieve excellent outcomes. We observe these communication and team-building benefits frequently in our work, particularly in the early stages of a project when a team is being formed. The benefits are even more valuable when the team is drawn from separate and perhaps disparate organisations. In these circumstances, all the participants have an opportunity to demonstrate their own technical expertise, and to see the technical expertise of others. Capabilities no longer have to be taken on trust, and technical confidence is instilled across the team.